Mobile Notary Public Closes Mortgages at Your Home or Office 24 Hour Service! To move from one house to another you need something to carry you through. We all need financial breakthrough and we can only achieve this by the help of others or lending institutions. It’s very essential to understand the institution you’re working with. Thinking of buying a new home? A mortgage is all you need. This is a form of a loan that transfers ownership of a home or real estate from a borrower to the lender who most in most cases is the bank. Mortgages are usually prepared to help in purchasing homes, repairing homes or to cover health or education of a child. As a home buyer or a borrower, you pledge your house to the bank and the bank has a right to claim that house should you be unable to pay the mortgage. The terms for such loans covers the administrative charges, repayment details, insurance, interest rates adjustment, use and maintenance of the property and minimum early repayment penalties and notice. Early repayment without a prior notice might call for a penalty paid to the bank. There are three options to choose from when applying for a mortgage. You should have a deep understanding of each before deciding on which one to go for. The first option is about fixed vs. adjustable rates. Do you want a fixed rate or adjustable-rate mortgage? Of cause they have pros and cons. The second option is government-insured verses conventional loans. After choosing between fixed rate and adjustable rates you need to decide whether to go for government insured home loans or conventional/regular. The last category that requires you to make a decision is jumbo verses conforming loan. Before you start the process of application you need to confirm your credit score and be sure that it’s strong and your report is free from any error. You should have the idea of your desired mortgage. Get the approval of borrowing a given amount and do some research about the lenders and finally put together all your loan paperwork. The whole process should take around 45 days but can be delayed if you’re not well organized. There are some essential factors that lenders/banks will always ask from you. The most common ones include credit report, credit standing, income, available funds, down payments and credit accounts. Most lenders will ask you to provide your proof of benefits received, last three month’s pay slips, utility bills, bank statement for the last 3-6 months, driving license/passport, if you’re self-employed you should produce tax statements of the last 2 years. When closing a mortgage in Maryland, you will need a notary to notarize your signatures. In some states you may need a notary public and 2 witnesses. The notary public and witness requirements vary from state to state. A mortgage mobile notary public signing agent will help you to successfully complete the closing and notarization. They specialize in obtaining and notarizing signatures of the involved parties. A 24 hour traveling notary is helpful in working around your schedule, so you are able to have the loan signing conducted at the best time for you. Most lenders heavily rely on loan signing agents to successfully transact real estate loans in a professional manner. Need a Signing Agent in Maryland to help with your loan documents? 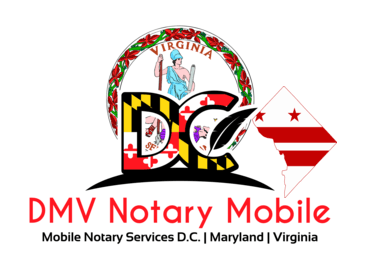 Contact DMV Notary Mobile at (202) 826-8179 or email here.